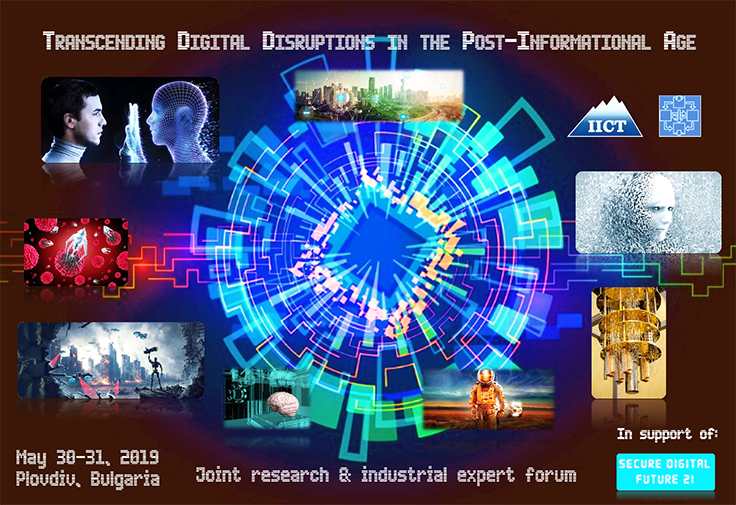 IT for Security Department, Institute of ICT, Bulgarian Academy of Sciences in cooperation with Association for the Development of the Information Society is organizing a joint research & industrial expert forum "Transcending Digital Disruptions in the Post-Informational Age". The forum will be organized for a second year (since 2018) and has been successfully established in the framework of the Securing Digital Future 21 initiative of the Joint Training Simulation & Analysis Centre, IT for Security Department. The new book “Future Digital Society Resilience in the Informational Age”, produced as a result of the 2018 start-up forum, encompassing future innovations and accents for the digital society resilience multiple necessities, achievements and perspectives will be also promoted to the participants. Selected & extended forum results will be published in a special issue of Information & Security. An International Journal. Where: May 30-31, 2019, Plovdiv, Bulgaria. Scientific session for the anniversary of "IT for Security"